The Abraham Ecumenical Centre was designed by Spanish architects Josep Benedito and Augusti Mateos for use by athletes during the 1992 Summer Olympics in Barcelona. According to an essay by Francisco Díez de Velasco, the International Olympic Committee recognizes five faiths (Protestantism and Catholicism, Islam, Buddhism, and Judaism) and stipulates that the houses of worship built for the games are to be implemented by public administration. Such was not the case in Barcelona, however: this ecumenical space was overseen by the archbishop of Barcelona and, at the end of the Games, converted to a Catholic house of worship. Slim crosses have been added to each façade of the rechristened Church of the Patriarch Abraham. Viewed aerially, the Centre’s distinct prayer spaces can be clearly seen. Their doors open up into a central corridor. The Centre’s piscine form is also clear from the blue prints. 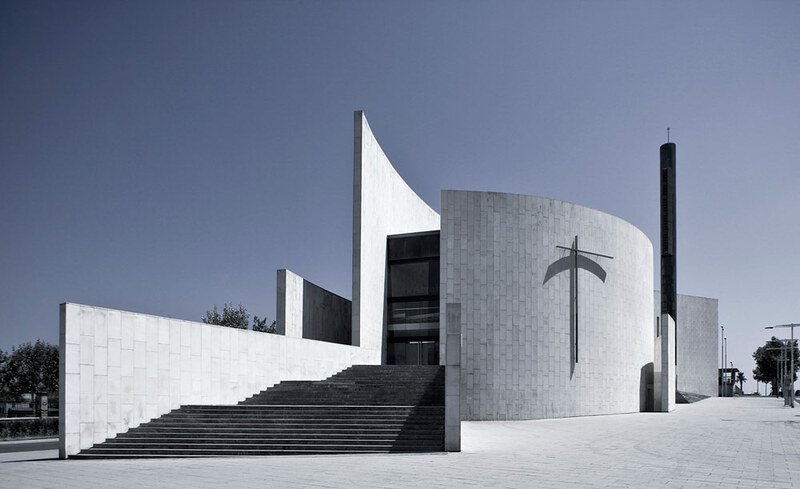 During the Olympics, the few citations of the Chapel linked the chapel’s fish shape to Barcelona’s Olympic themes, including its resonance with Frank Gehry’s “fish” sculpture. Its sculptural “flag” in the courtyard likewise was understood in the context of a ship’s mast. These non-sectarian “symbols” were recuperated as Christian after the end of the games.